Today, some DXBenchmark results appeared on their website, referring to a device named NVidia Wayne. While there is not much information available, it looks a lot like a development board containing the much anticipated NVIDIA Tegra 4 SoC. The results were posted by an anonymous user. The results point to a device named Covington, which could be the name of the development board. The GPU is named Wayne, which is just the codename for the Tegra 4. The screen resolution is 1371 x 771, and the device runs on four CPU cores, further indicating it's the Tegra 4, or the Tegra 4i. 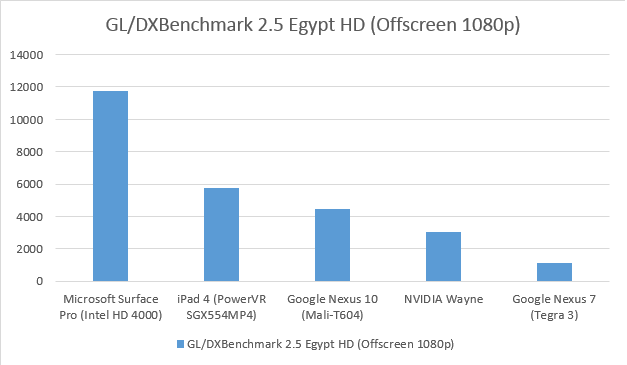 As these results seem to be far below what NVIDIA promised for the Tegra 4, and as these results would point to the Tegra 4 being much weaker compared to the competition, it could be that these are benchmark results for the watered-down Tegra 4i. 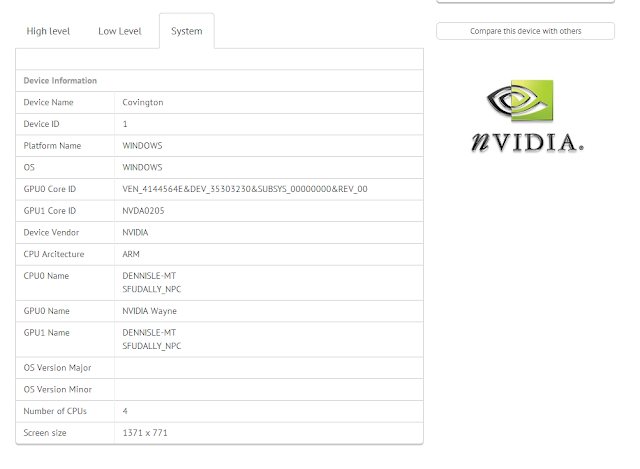 However, Tegra 4i`s codename is 'Grey', and not 'Wayne', despite the results having the name 'Wayne'. But still, these results do sound more like Tegra 4i than Tegra 4 from a performance standpoint. 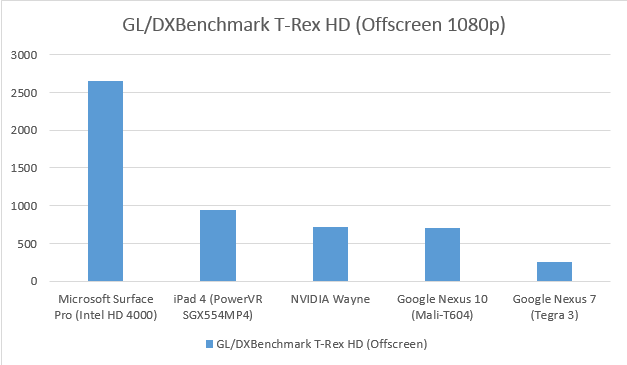 Ok, so let's break these results down and compare them with current competitors and older Tegra iterations. Fill rate looks particularly low in these results. In fact, Tegra 4 is supposed to have a fill rate close to the Nexus 10 or the iPad 4, since they all offer peak theoretical memory bandwidths of 12.8 GB/s. Even so, if this really is the Tegra 4 at final clocks, fill rate is extremely low, especially considering that current hi-res smartphones and tablets need high fill rate to satisfy the immense amount of pixels. It would make a lot of sense if these results pertained to Tegra 4i, since the lower end SoC has a single-channel memory controller (as opposed to Tegra 4's dual-channel memory interface) of 6.4 GB/s. If this was Tegra 4i, it would really explain the low fill rate. 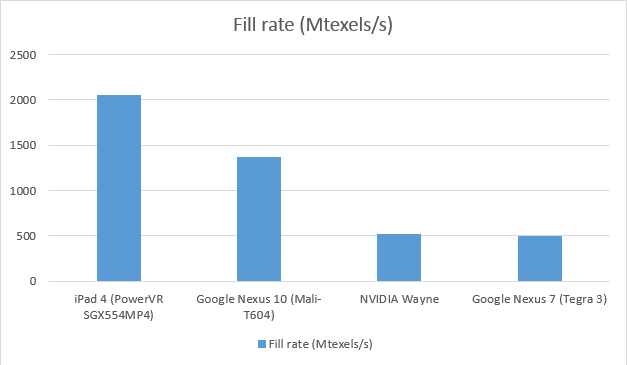 In this fill test, Tegra 4 (or 4i, hopefully) appears far below the competition from Apple/ImgTech, and Google/ARM. Also, it appears to be only a marginal improvement over the last-gen Tegra 3, and even offers less fill rate than the Tegra T33 inside the ASUS Transformer Pad Infinity, which has HALF the theoretical memory bandwidth of the Tegra 4 and the same bandwidth of the Tegra 4i. The fact that the fill rate is lower than Tegra 3 is the main reason for me to believe that this Tegra 4/4i is either running at lower than final clocks or on incomplete drivers. 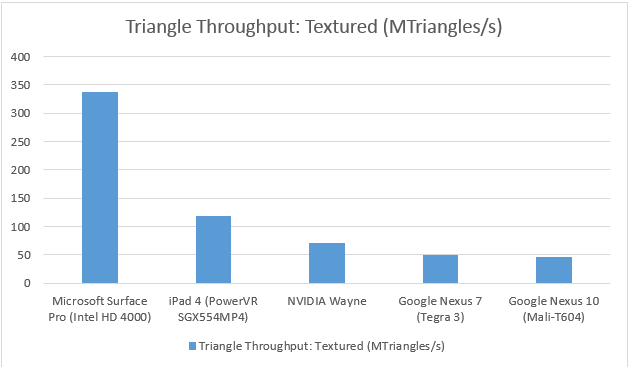 Triangle throughput has always been the forte of the Tegra series, but the Tegra 4/4i doesn't seem to live up to that tradition in those results. While the triangle throughput is definitely an improvement over what is seen in Tegra 3, both of which outperform the ARM Mali-T604. it lags far behind Apple's latest iPad. The Tegra 4/4i performs very well in this test. In fact, it outperforms the beastly iPad 4's graphics, but that, of course, is because of the very low resolution at which Wayne is running in this test. Wayne is running this test at the lowest resolution of all the devices compared here, together with the Nexus 7. Nevertheless, whatever Tegra 4 iteration this is, it appears to perform almost 4x as much as the Tegra 3 (given that their resolutions are very similar), which does not fullfill NVIDIA's promise of a 6x improvement. Not quite what NVIDIA promised, but still, quite an improvement. Normalize the resolution to 1080p, and the iPad 4 takes the lead again. Still, this test paints a good picture for Tegra 4/4i. 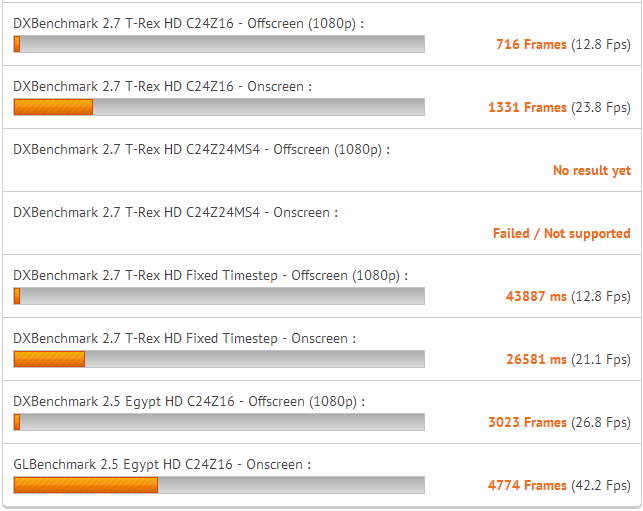 Compared to the Mali-T604 in the Nexus 10, Wayne could process 17 frames more (716 vs 699). Not a very significant improvement, but it at least shows that this Tegra can be as good as the Mali-T604. This test shows almost a 3x improvement over Tegra 3. Still not quite living up to NVIDIA's promise. Now, here's a test we're more familiar with. At the low resolution of 1366x768, the Tegra 4/4i can really shine. Once again, it outperforms the iPad 4, both of which come closer to the Microsoft Surface Pro and its PC-class Intel HD 4000 graphics. This test shows a 2.5x improvement over the Tegra 3. 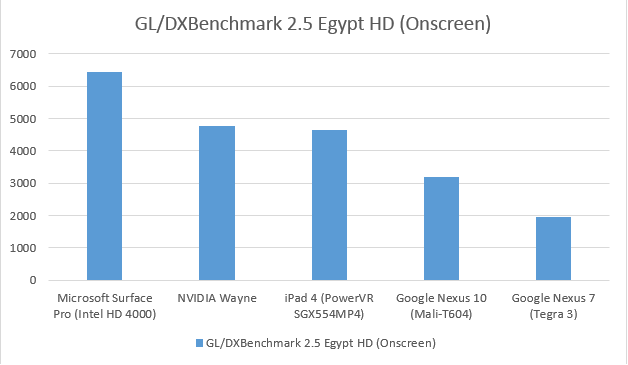 Normalize resolution, and the Tegra 4/4i not only falls behind the iPad 4, but also the Nexus 10. Now that is embarassing! 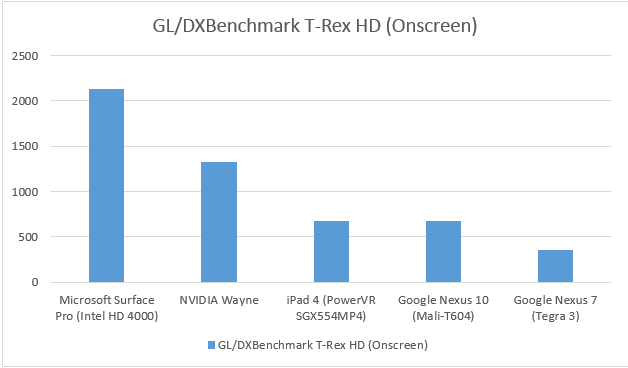 Actually, the margin between Wayne and the Nexus 10 is quite big, and even bigger between Wayne and the iPad 4. Tegra 4 is only performing about 2.6x as much as the Tegra 3. And the two Tegras (4/4i and 3) sit embarrasingly at the bottom of the benchmark results. Of course, these are probably results of a Tegra 4 device that either isn't running on final clocks or has premature drivers, if this is Tegra 4 at all. The weird thing is, Tegra 4 is about to be released this quarter of the year. By this point, NVIDIA should have Tegra 4 running on final clocks and drivers. If this turns out to be the true prowess of Tegra 4, I must admit my disappointment. Firstly, NVIDIA promised 6x the performance of Tegra 3, and hardly half of that was fulfilled, according to these tests. A 72-core GPU looked very promising, but if this is it, then Tegra 4 turned out to be far below my expectations. Still, chances are that this is Tegra 4's little brother, the Tegra 4i, which would explain the underachieving GPU (Tegra 4i only has 60 GPU cores and less memory bandwidth) and the lack of fill rate. Actually, I'm really hoping this is Tegra 4i, and not Tegra 4. Thanks for the amazing content on your blog I am very interested in this article and you have really helped me.